Another post-apocalyptic novel and one that so many have reviewed already. 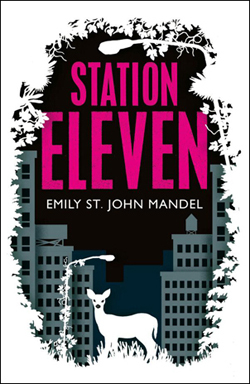 Still, I have to write about Station Eleven because it’s such an impressive book and even though there are so many dystopian and post-apocalyptic books published every year, this one stands out. To a large extent because it’s one of a few – maybe even the only one – that doesn’t make you feel as if someone just bashed you over the head. It has so many moments of glorious beauty that you’ll finish it without feeling a major depression coming on. The book opens with a theater play. It’s Arthur Leander’s last performance of King Lear. Although he dies during the play he has a pivotal role in the book. The night of the play, a winter night in Toronto, isn’t only Arthur’s last night, it marks the end of most of humanity. In a few days a pandemic will have wiped out 99% of the world’s population. From that night the novel flash forwards to the future, fifteen years later. Kirsten is part of the Travelling Symphony, an orchestra and theater group who performs Shakespeare plays while travelling from one place to the next. The world has changed a great deal. Everywhere lie the remnants of the old world, in which there still was electricity, air planes, iPhones etc. I mentioned that Arthur Leander has a pivotal role and that’s because Emily St. John Mandel decided to tell the story of all those who were close to him and present when he died, including the story of some other people linked to him. Kirsten, for example, played a child Cordelia in this modern interpretation of Shakespeare’s play. Some of the people who were close to Arthur will make it, some won’t. There are some heartbreaking scenes when we read how some of them struggle in vain and die during the pandemic. What makes the book stand out, apart from the ingenious structure, was how people looked back on what they lost. It makes you grateful for everything we have but at the same time, the book shows that there will always be great things. Because the society we live in now has so much to offer, so much beauty – art, theater, even technology – that, although 99% of its population are wiped out, many live in a lawless state, and other’s form fanatic cults, there’s still enough that has survived and will go on making our world a special place. I wonder if this book made it into other people’s dreams as well. While I was reading it, I dreamt every night of the landscapes in the book. That’s why I called it impressive. It’s not overburdened with descriptions but what little she uses is very powerful. If you wonder why it’s called Station Eleven – the title refers to a comic book one of the characters has been drawing almost all of her life. I liked that the book made me look at what I have and wonder what I would like to keep. Even when it comes to objects. Only things that are useful or even things that are just beautiful? I could say a lot more about this book but I feel it’s OK to only write a short review because there are so many around at the moment. The important thing is – pick it up. It’s really worth it. If you love post-apocalyptic stories, you’ll read it anyway. If you don’t, maybe it will show you that not every book about the end must be traumatic. Certainly not one that makes you grateful for everything we have and, ultimately, shows that it’s possible to find beauty, no matter what will happen to our world. Nothing illustrates the message of the book better than the reversal of Sartre’s famous quote L’enfer c’est les autres – Hell is other people. In the novel Kirsten thinks that he’s wrong. She has come to the conclusion that hell is the absence of people you feel close to. I haven’t read The Road yet but I could imagine the two complement each other; one being very gloomy, the other one very luminous. I so want to read this book and after your review I feel I must. I love dystopian novels. I have seen Sartre’s quote before and always thought it was cruel. Makes you wonder what kind of people he had in his life. I like Kirsten’s interpretation a lot better. I’ve read so many dystopian novels lately and will have to review them all. Those for YA aren’t as negative but they are often not profound. I hope you will read it. I’d love to hear what you think of it. I find it’s brlliant in places and overall so good and beautiful. Sure, Sarte’s quote is not optimistic but at the same time, many hellish things are man-made. But I think she’s right. The book says a lot of poignant things about loneliness. I loved this book too ….i thought all the Shakespeare nods were very clever too . Hmmm The Road is EXTREMELY grim …to be perfectly honest i didnt like it all that much ! I’m glad to hear that you liked it as wel. It’s much cleverer than I managed to make it sound. It has a lot of intertextuality to offer. I will read THe Road sooner or later but I know it will be a very different experinece from this. I think she alluded to it a few times though. I enjoyed ( and admired ) your review ….i ducked writing one ( i didnt have a review copy) as it really was so multi layered …. Thanks, that’s kind of you. I was looking for your review and couldn’t find it. Now I know why. It’s complex, I agree. Glad to read you enjoyed this one too, I really must start it soon! I did. I somtimes skip a book when too many reand and review it but it would have been my loss. Great review, Caroline. This book sounds so finely judged, more subtle than many other post-apocalyptic novels. I really like what you say about the possibility of finding moments of beauty alongside the trauma. Would it be suitable for teenagers, do you think? Thanks, Jacqui. It ia very subtle, completely different from most of the others I have read. To be fair one has to mention that she has certainly been influenced by what has been written before and tried to see it in a different way. But there’s so much more. It would be suitable for a teenager if she/he was aware it’s not Divergent or something like that. It’s literary in the way it’s written and structured. No chronoligical story telling, multiple POVs. More than one charcater is very young which would allow identification. It depends on the reader. Oh, that’s great – thank you. I think it would suit the teenager I have in mind and I’m always on the lookout for interesting books for her. I hope she’ll like it. I’d be interested to know. Thansk, Carole. I get it but I think if you ever wanted to read one – it would be a good novel to try. It has such lovely scenes. I was going to wait until the hype dies down a little bit before reading this one, but now I’m thinking I should put a Hold on it at the library. There’s another book by this author that sounds intriguing, “Last Night in Montreal.” It’s also available at my library, and there’s no waiting list for it. I was actually surprised when I saw how many books she’s already written. It might be one reason why the writing is so assured. I sometimes wait as well but in this case I couldn’t and it’s interesting to read a book when others do too beacsue you can discuss it. I hope you’ll like it. I’d be also interested to hear what you think of the other one. What a lovely review! A friend bought me this for Christmas and I was delighted as I’d read so much about it. Thank you, Cathy. I hope you like it as well. I only scratched the surface. It’s so multi-layered. You’re welcome. 🙂 I think it’s a book we needed. The end of the world as we know it something scary and seeing somone try to find beauty in it – well it’s a good thing. And it’s so much more than just about the end. Yes. Especially at the moment when so many things around us seem to be falling apart (Ebola, terrorism, Ukraine, Pegida, you name it…) I find myself craving reads that don’t paint entirely dismal pictures of the world. I know that’s escapist, but I can’t help it. So this sounds like a book that inspires hope despite harsh surroundings and without ignoring them. I like the idea. I agree with you. I feel the same. I’m not one to ignore the dark things around us but I need to come up for air. It’s not necessarily escapist though. I think we get resilient by nurturing positive thoughts as well. I’m glad to read a feedback from someone else who read them both. I still need to read The Road. Wonderful review, Caroline! I love the central theme of the book – that it is possible to find beauty whatever the circumstances. I loved the contrast you have described between Sartre’s quote and the book’s central theme. I have a complex relationship with Sartre’s quote – sometimes I agree with it and at other times I don’t. It is interesting that the book looks at a dystopian situation from the perspective of a a playwright’s friends and family and describes how things change for them. I will add this book to my wishlist. Thanks, Vishy. I’m with you on the Sartre quote. I sometimes agree, sometimes I don’t. I’m pretty sure you will like this a lot. Arthur isn’t a playwright, he’s an actor. I should have been explicit,saying it’s his last performance as King Lear. Sorry about the confusion. I really think you’ll love all those moments of beauty she captures. No sorry 🙂 Because you weren’t explicit about it, I thought that Arthur could be a playwright or an actor, but decided to plump for playwright as he dies during the play and so I thought he couldn’t be the actor. Of course, I made a huge mistaken assumption – that he wrote the play. How could he, because it is ‘King Lear’ 🙂 I think this is a good quiz question – to find out who Arthur is after reading your review 🙂 I will look for this book. Nice to know that you have an interesting relationship with Sartre’s quote too. 🙂 He could have been the director. King Lear is quite important in the book, although I haven’t fully figured out why she chose that play. Maybe you’ll know. Yes, he could have been the director too! I somehow missed that! Indeed I have heard a lot about this book. I do think that it is worth it to express ones thoughts on works that many others have also. I do like like these plague is killing everyone books. There have been some great ones over the years, I really have got to get around to reading this one as everyone says that it is so good. Thanks, Brian. I would love to hear your thoughts on this. I could imagine you’d like it. There are a lot of books like this but they are mostly bleak. Regarding The Road by the way, there’s a review at mine and in my view you don’t need to read it. I think it’s overrated and frankly doesn’t merit the attention it’s received. I’m fairly critical of it in the review and if anything it’s diminished in memory. It’s also about the bleakest thing you’ll likely read in a long while, but artificially so since the scenario it posits is never really a credible one (unlike say Olmi’s Beside the Sea which is horrifically bleak but does actually have something to say). “The snow fell, nor did it cease to fall.” remains for me an unforgiveable sentence, plus using words like “discalced” and then immediately explaining what they mean because you don’t trust the readers to know (fairly, almost nobody knows that word, including me prior to The Road). Either don’t use the word or make it clear from context, but using an unusual word then explaining it in the text is just bad writing as at that point you might as well not have used it in the first place. I wonder what you’d think about this one but I understand if you give it a pass. I’m not entirely sure about the Sharkespeare element in this book. Of course it’s an easy reference. It would have been different if she’d chose another playwright. I have heard dreaful things about the writing style of Cormac McCarthy and that alone, as absurd as it may seem, makes me want to pick it up. I hate it when they explain things. At least discalced isn’t an every day word. Some authors would even explain easier words. And I don’t like artificially bleak. I’m selfish and hope you’ll read Station Eleven because I’d really love to hear your thoughts. Evene if you find a lot of faults – it does have a few, of course. Yes, he is. I haven’t seen the movie either because I always meant to read the book. Not so sure anymore. I’m one of those people who veer away from dystopian fiction. It usually makes me start wondering weird things and concluding that I wouldn’t want to make it. I’ve been thinking along those lines as well. I guess it really depends on what brings on the apocalypse. It wouldn’t be pleasant, that’s for sure. I read a short story that was set post apocalypse, and it was actually quite funny. After the Plague, written by T.C. Boyle. I think I’ve read that as well. Fantastic review. I hadn’t thought I would want to read this novel, but you might have just changed my mind. Thanks, Heavenali. I think it’s very special and even if you don’t like the subgenre as such, it has a lot to offer. There are many quiet, introspective moments, which are so lovely. Even though I’m not sure a dystopian novel is for me, I did buy The Dog Stars by Peter Heller (although I’ve hesitated starting it for some reason). But you’ve made this one sound so different, and so good, that I believe I’ll look for it at the library this afternoon. I’ll let you know if I agree with you after I’ve read it. Your review is one of the best I’ve read of this book. Thanks, for the kind words, Grad. I hope you’ll let me know how you liked it. I’ve read so many dystopian ans post-apocalyptic novels lately (mostly not reviewed) and this really stood out. >>>What makes the book stand out, apart from the ingenious structure, was how people looked back on what they lost. It makes you grateful for everything we have but at the same time, the book shows that there will always be great things. So, so true. This is what stood out to me about Station Eleven compared to most of the dystopian fiction I’ve read in the past. It made it an exceptional read for me. Glad to hear you felt the same. I agree, it’s exceptional. Btw – I keep on leaving comments on your blog and they vanish. It’s strange. I’ve heard so many good things about this book! I actually had it out from the library over my break and had barely started it, but I was feeling so overwhelmed by things and wanted to start the new year with a clean slate that I returned it (and suspect it is checked out now and will have to get in line if I want a library copy). Maybe it is one to own when it comes out in paper. It certainly seems to have made an impression on you-I can’t think of the last time a book made me dream! I know you have read lots of dystopian novels–is this a favorite now? It’s not so much dystopian as post-apocalyptic. There’s no government in place. Maybe I liked that idea as well. It’s groups of people trying to get by. I think it’s one of the very best because it offers much more than just a look at how it could be. The structure is really ingenious. In a way it’s scary because it has one of the most plausible scenarios. I could really imagine us all being wiped out by a pandemic. Thanks, Jackie. I hope you’ll pick it up. I think she wrote a really special novel. It’s quite interesting to see how she chose to strcuture it and there are such lovely passages. I really don’t think I’m up for The Road at the moment. I have this one on my tablet but have been waiting for the buzz to die down a bit before reading it. I’m funny like that. But it sounds like there is substance there beneath the buzz. And I may be the exception, but I actually liked The Road – heartbreaking and tough, but ultimately hopeful – what can be more powerful than parental love? I totally understand that kind of thinking. I’m often like that – my piles would tell you. But in this case I’m glad I read it this early. There is substnace, I’d say. I suppose I’ll read The Road some day. I read about that element of parental love. Interestingly most people in this novel aren’t parents. I can’t imagine what it would be like for a parent. I’m looking forwad to read your thoughts when you pick it up.